1.8 How To Apply For APSC CDPO Recruitment 2019? APSC CDPO Recruitment 2019: Candidates who are looking for the Government jobs in Assam state, for them it is good news. Yes, the Assam Public Service Commission (APSC) authority has released the APSC CDPO Recruitment 2019 Notification for Computer Operator (Typist), Child Development Project Officer posts. Applicants who are ready to apply for these posts then apply before 6th March 2019. Candidates can get more information about APSC CDPO Recruitment 2019 Notification such as eligibility criteria, salary details, selection process, post-wise vacancies, important dates, application fee, and simple set of instructions to download the Notification from this article. Applicants, who are ready to apply for APSC CDPO Recruitment 2019 notification can also check the educational qualifications for Computer Operator (Typist), Child Development Project Officer & allied cadres under the Social Welfare Department Posts. Higher Secondary/Class-XII passed from the Govt. recognized Board/Council. Candidates must possess a minimum 6 (six) months completed diploma/certificate in computer proficiency, from a Govt. Of Assam recognized institution (no breaks in qualification admissible) and must have computing knowledge in Assamese and English Language. 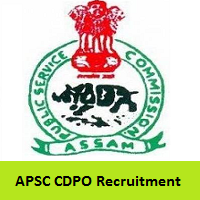 For all candidates, before applying for this job must and should you can see the post-wise vacancies for APSC CDPO Recruitment 2019. (i) The selection process will consist of two phases. Written Exam of 100 (Phase-I) marks and Computer Practical Test of 100 marks. Rs.14000-49000/- with Grade Pay of Rs.6,200/- plus other allowances as admissible under the Rules. How To Apply For APSC CDPO Recruitment 2019? First of all, candidates have to see the official website of the Assam Public Service Commission (APSC) that is www.apsc.nic.in. In that, you can see the more features, then go to the notices section. And you can see the recruitment property on that page. Then search for the flashing link of APSC CDPO Recruitment 2019. Read the complete APSC CDPO Recruitment 2019 notification carefully. After reading the entire notification, if you are eligible then apply for the APSC CDPO Recruitment 2019. Then fill the details in APSC CDPO Recruitment 2019 application form correctly. Recheck all the entered information weather right or not. Take two or more copies of APSC CDPO Recruitment 2019 application form for future reference. Our team Sarkari Naukri had given the complete and genuine details regarding the APSC CDPO Recruitment 2019 which is useful for everyone to apply for the notification. Candidates can bookmark our site by clicking Ctrl+D, and they can also share this information with their friends also. Thank you.